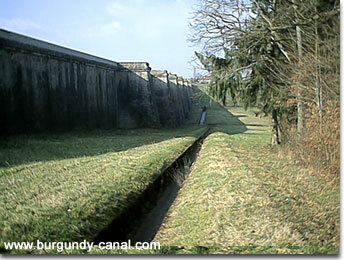 The greatest problem for the Burgundy Canal since its construction, has been to maintain an adequate supply of water, necessary to operating the locks which allow the barges to cruise. Millions of tons of water are required each year so that the locks can be filled. To accomplish this, water is stored and supplied in different ways. All the reservoirs are filled with the winter snows and rains. There are small "canals" supplying water from the reservoirs to the canal, these being controlled by the local keepers. The water is sent from the reservoirs to the canal at critical times and in a regulated manner to assist in maintaining the required water levels. The canal uses reservoirs, rivers and springs to accumulate and store water. 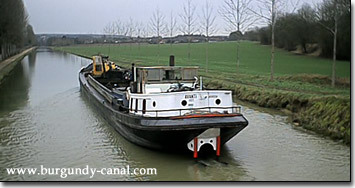 Delivery of water depends on the altitude of the canal. 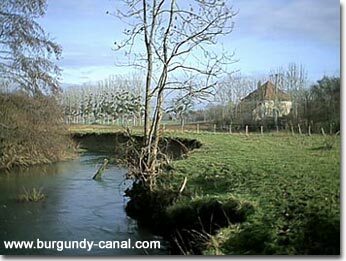 Near the summit of the canal between Veneray, Pouilly and Crugey, the water is supplied by 5 reservoirs: Grosbois, Cercey, Panthier, Tillot and Chazilly. Through the years the reservoirs have also developed their own "micro" ecological environments. 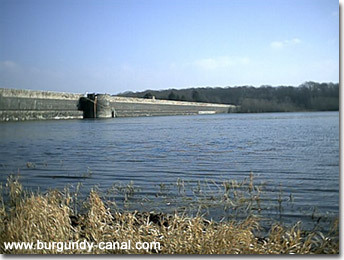 The most spectacular reservoir on the Burgundy canal is the reservoir of Grosbois. The dam of the reservoir was built in 1830 to 1838, and is 22.30 metres high, with a capacity of 9,220,000 cubic tonnes of water. In 1842, nine reinforcements where built giving the dam more stability. The dam is 530 metres long, and the surface area of the reservoir is 105 hectares. Due to lack of funding and upkeep, the capacity has been reduced to 7,800,000 m3. There is also an additional part to the reservoir below the main damn, built in 1900. A supplementary earthen dam was built holding 820,000 m3 of water, in an attempt to increase water reserves for the canal. Further work on the dam in 1986 increased the capacity to 910,000 m3. Cercey reservoir with its earth dam of 1.02 km and capacity of 3,590,000 m3, was built in 1834 and took 2 years to complete.. Stone reinforcements were built in 1868 to prevent land slides. The reservoir covers 63 hectares. Panthier with an earth dam, 7.60 metres high, was built in 1834 and then enlarged in 1869 to 13.94 metres, to hold 8,050,000 m3 of water. It covers 120 hectares. The reservoir is below the summit of the canal at Escommes, and acts as an overflow in capturing water from the summit. The first "pound" that Panthier can supply is at lock 9 Saône. A large, popular camp site has developed at Panthier, along with sailing and fishing. Tillot has a stone dam and reinforcements, and was built in 1830. The dam is 9.30 metres high and holds only 520,000 m3. Chazilly is very similar to Grosbois, the stone dam being 22 metres high and a capacity of 5,190,000 m3 of water covering 52 hectares. The dam wall of Chazilly is very impressive and reaches a height of 22.5 metres. Construction of the reservoir took 7 years from 1830 to 1837, overseen by the engineer M Bonnetat. The Lac du Pont with it's granite wall, was built in 1879 to capture water from the Armançon river. The reservoir holds 6,000,000 m3 of water, covering 80 hectares with a perimeter of 12,3 kilometres.